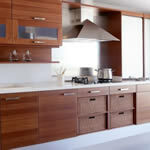 Modern kitchens are simple and uncluttered. 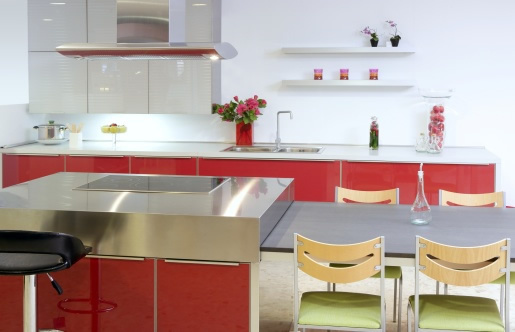 They use basic symmetrical shapes and revel in bright colors to offset wood, granite, laminate, or stainless steel surfaces. Accents might include a rich solid color laminate countertop, a backsplash of one inch high glass or stone horizontal tiles, or sleek pendant lighting at a uniform or staggered height over a kitchen island. 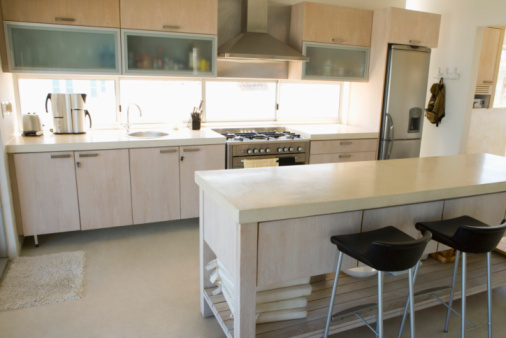 Hide countertop appliances in appliance garages. Choose windows with slender insulated aluminum frames. No curtains, of course--blinds or pleated shades will keep that crisp, airy feeling that complements other decor elements. Monochromatic color schemes using noticeably different shades of the same color are often chosen, and black and white is another sophisticated theme. Alternately, choose cabinet doors with somewhat parallel grain for both a color and texture element, then select a color that complements them. 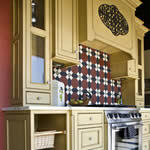 A bonus for this kitchen remodel: modern kitchens have a timeless look that may outlast many other kitchen styles.